I had the wonderful, exhausting and exhilarating job of presenting a two day Libraries 2.0 Masterclass this week, with the delightful Kathryn Greenhill. Glad to say, it was an all round success, with wonderful feedback and responses from our 19 attendees. Kathryn has covered the days with our tweets, through a Cover It Live session at Librarians Matter. It is well worth checking out. So instead, I will go over what we covered in the two day workshop and outline what I got out of it, as a presenter and on the side participant. Day 1 was Kathryn doing all the hard work. We began with a few introductions and then some get to know you exercises, which gave us and all participants information on their sector, their library size and the openness of their IT systems. It was useful information for us, but also for attendees as straight away they knew they were learning alongside people who came from pretty much the same sort of environment they were working in. Here’s the fast forward bit. 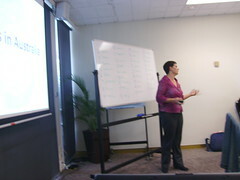 Kathryn did presentations on Web 2.0, Shift in power and Library 2.0 and after morning tea I presented on Web 2.0 tools. 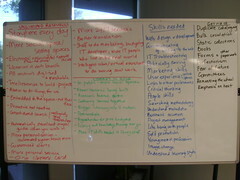 Which means to say we had a list of 36 types of tools which we had participants research and present back to the group. They had to explain what it was and why libraries should care, with me filling in the gaps. Most of the way through lunch, I did a quick Twitter clinic, showing how to sigh up etc. After lunch it was Kathryn again with eBooks, the library in the cloud and opening up the library. We finished with some futures dreaming exercises. Kathryn and I finished our day with a lovely relaxing dinner at Lygon Street. Day 2 was me carrying most of the load, although I’m still convinced I had an easier time of it than Kathryn. We began with a recap and an indication of things that attendees would like covered (which I think we did). We then gave them some time to think about three projects they would like to undertake when they got back to work. 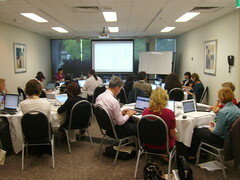 I then presented on Library 2.0 and users and Learning 2.0 before Kathryn took us on a fun journey on Creating media. The end of lunch was filled with an informal Sharepoint sharing session for quite a few attendees and Kathryn and I did quick demos of both Word Press and Drupal as content management systems. Fortunately, after afternoon tea, we got participants to plan out an action plan for one project they were going to undertake once they got back to work (chosen from the three they had written down earlier), using the worksheet provided. They then had to practice an elevator pitch with the attendees at their table, giving them immediate practice at explaining their plans. I worked with Kathryn to create and run this program. If you have to do something like this with anyone, Kathryn is your person. Passion takes you a long way. I was getting very tired by the 2nd half of the second day and had a sore throat as well, but my passion for the topic and helping others to see the value in these tools, carried me through and them along with me. Our attendees were a great group of people who were passionate in their own way. Passionate about their libraries and enthusiastic about the possibilities that could be opened up to them through using these tools. I really loved seeing them think of ways to get around restrictions imposed on them by their workplaces. The collaboration that happened between the attendees with similar interests or situations. Whenever we weren’t presenting to them or they were using their workbooks, they were sharing ideas, possibilities and more about their work environments. I think it was very encouraging for them to be able to spend that time with colleagues in similar circumstances and it was wonderful for us to see that collaboration happen. Inspiration to think outside of the box, which came as a result of our futures dreaming session and from hearing of our enthusiastic attendees plans for projects in their workplace. A need for rest. Fortunately, Easter started a day later. I’m back at work this week and this whole event already seems like a long time ago. But it has helped to fire me up further with possibilities and plans of my own, which makes me even happier to know that it was more of a two way process than I realised. Check out more photos at Flickr.